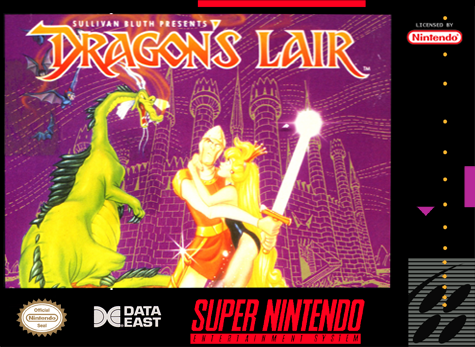 Dragon’s Lair for the Super Nintendo couldn’t be a port of the video-laden arcade game that everyone remembers. It was turned into a bad platformer instead! Much like yesterday’s game, Dragon’s Lair suffers from bad controls. The player character, Dirk, carries a huge amount of momentum in his movements, so you end up sliding around everywhere. It’s like playing an ice level in Super Mario World, except it’s always like that. Expect to slide off into bottomless pits or into surprise enemies. There’s no excuse for a game with platforming elements to not work on such a basic level. It’s like having a first person shooter that has unsatisfying shooting or a racing game that is hard to steer. If you can ignore that problem, what’s here is standard platforming action. You can jump, you can swing your sword, and you can throw a few different sub-weapons you’ll find in blocks you can destroy with your sword. The sub-weapons I found have direct Castlevania equivalents; you start with an axe you throw in an arc, and I found a dagger that hits enemies directly in front of you. I don’t think there’s any ammo or limit to these items so I recommend spamming them. The sword in Dragon’s Lair is more interesting because Dirk doesn’t swing when you press the button, just when it’s depressed. It works okay, but the earlier concerns about the controls mean you won’t want to get any closer to enemies than you have to. Just because playing the game is almost torturous doesn’t mean the graphics can’t be fine. It’s easy to look at Dragon’s Lair and immediately recognize Don Bluth‘s art style. Dirk is well animated, too, giving Dragon’s Lair a smoother and more cartoon-like look than most other platformers. His death animation even makes the transition! I just can’t get over how bad the controls in Dragon’s Lair are. I don’t even know why the developers went to the effort to make this game at all! I feel bad for people who bought this expecting the original game. But the arcade game was a huge hit, so here we are. Tomorrow: I’m on board with Harley’s Humongous Adventure because humongous is a great word. That snake is getting a sword to the face. These flying dragon heads are annoying. They appear out of nowhere! The first … boss? Hit him a bunch and he falls. Dirk turns into a skeleton and falls to the ground when out of health.